The last couple of weeks have seen a change in discipline, jumping the fence into the hack ring. The showjumpers were given a 2-week break from their usual show preparation routine, which they happily accepted for a grassy paddock. The show ring campaign started at Noosa Show with a very early morning start. Welt’s Electra (Ellie) began her show career with a bang, winning her maiden hunter class, novice hunter class and working a treat to help me win my Lady riders class. Not too distant from the show jumping ring, the working hunter revealed Elle’s lovely jumping technique, where she was awarded Reserve Champion Working Hunter. 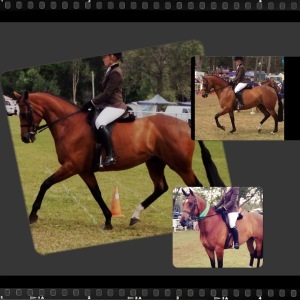 The following week saw Elle continue to wow the judges at Kenilworth Show, winning her led Warmblood Mare class, where she continued on to win Champion Led Warmblood of the show. I am very excited about Elle’s progress in the ring, showing enormous potential in such early stages of her career. I have received many positive comments regarding Elle’s condition and overall appearance. Maintaining show condition is made easy thanks to the superb quality of Mi-feed products. I look forward to the 2015 show season with this very exciting mare in action.